The future is mobile and apps, except that it isn't. 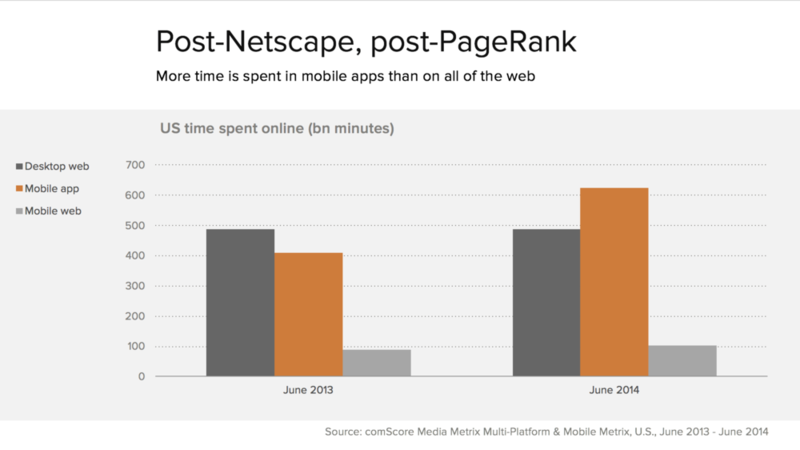 There are two charts that capture a lot of the way we think about mobile today. In the first, we see that mobile devices are approaching a majority of traffic, and in the second, that a large proportion of all web traffic (a majority in the USA in this instance) and the vast majority of mobile traffic is coming from apps rather than the web. However, if you're not careful you can get quite the wrong impression from these. First, look at where people actually use their devices. This is a picture that you see in all the relevant data (use of cellular versus wifi data, for example) - most use of 'mobile' devices happens at home or at work, or sitting down in a coffee shop - at any rate, not just while you're walking down the street or queueing at a shop. People use their mobile devices everywhere, and mostly, that actually means when they're sitting down. The fact that the IBM data above, like much 'mobile' data, actually includes tablets, is something of a clue - people obviously use tablets sitting down. But that's true of smartphones too. When we talk about designing for mobile use, we tend to talk in terms of building experiences that people can see in brief moments while they glance at their phone, because they're queuing or walking or waiting for a lift or whatever. By extension, that means that 'mobile' can - no, should - be a subset of the full experience. But actually, people do do that but they also, increasingly, spend half an hour burrowing though the web or into an app, while they're sitting at home, even with a laptop in reach. So the mobile experience needs to be complete. That might, paradoxically, mean that your total experience might need to be edited, to fit, but it's dangerous to pick a subset of your offer and put just that on mobile - it might be your only touch point. Conversely, one could argue that in some cases it's the desktop experience that should be a subset of the mobile one. Second, about that app share of use. The great majority of app use is of course Facebook and YouTube, and in fact, app use of the internet overall is highly concentrated into a relatively small number of highly successful apps. If one looks at how people use the web on the desktop, though, you see something very similar. Most people have perhaps 10 or 20 web sites that they visit regularly in a conscious, directed way - they type the URL or click a bookmark or (most likely) search for the service name. Everything else they get to though social or search. And on mobile, most people, again, have perhaps 10 or 20 services that they use regularly - except that on a smartphone those are apps. And everything else they get to through search or social - except that social happens as a web view inside the Facebook or Twitter app and so counts as 'app use' as well. That is, there's a very fat head to the distribution of use on both mobile and desktop, and on mobile that goes to apps while on the desktop it generally remains within the web browser. Apps unbundle the top services into their own apps. 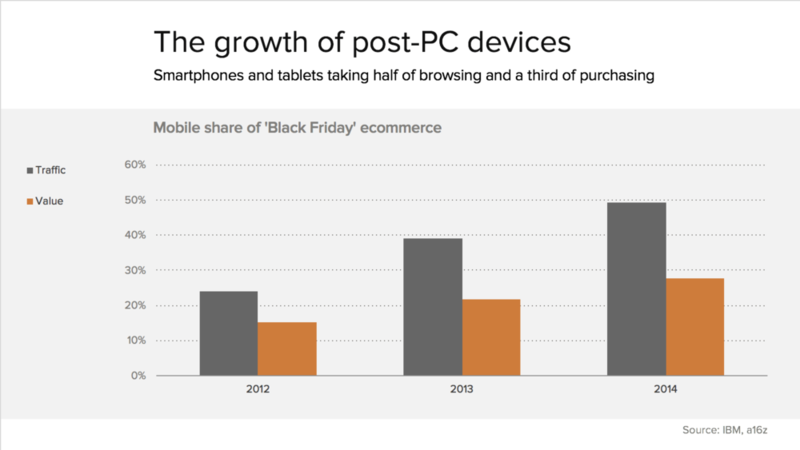 But the dynamic for everything else has changed less - it's still on the web, mostly. As I wrote here, if people have a relationship with your service such that they'll want to put your icon on the home screen - if they'll make a conscious choice to go to you - then you should have an app as well as a website. If you're in that category then everything has changed relative to the desktop internet. But if not, then the web, search and social are still most of the story. Hence, one of the interesting trends at the moment is the attempt to bridge the web with native, non-web experiences. We see that with Google Now and Facebook Messenger (desktop sites where you place an order while signed into Facebook can send messages to you in Messenger) and with a lot of what Google is thinking with Chrome. That's not really here just yet, though.